Jonathan Edwards Motel features 26 air-conditioned guest rooms and a 3 bedroom 1000 square foot unit, all with convenient ground level access. All of our rooms are non-smoking and contain one or two beds with a sleek, modern décor; king-sized beds or two queens; and a full bathroom. 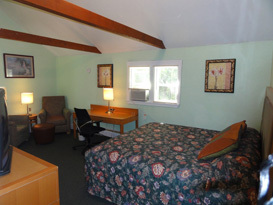 Rates range from $65 - $499 per night, based on double-occupancy. 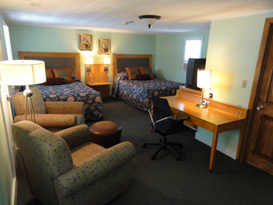 Our rooms are spacious and comfortable with air-conditioning, 27" color TV, and a refrigerator. DVD players, irons, ironing boards, and hair dryers are also available upon request. Rooms fill up fast, so please book your room today! You can e-mail us or call us to make a reservation. 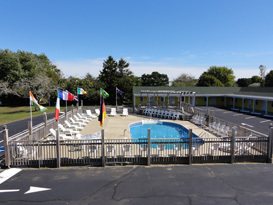 We have an outdoor swimming pool with loungers so you can relax in the warm Cape Cod sun. You can take a dip in the pool or barbecue on the grills in our picnic area. We have picnic tables, grills, a large sun tanning deck, horseshoes, and a shuffle board set up for your enjoyment.